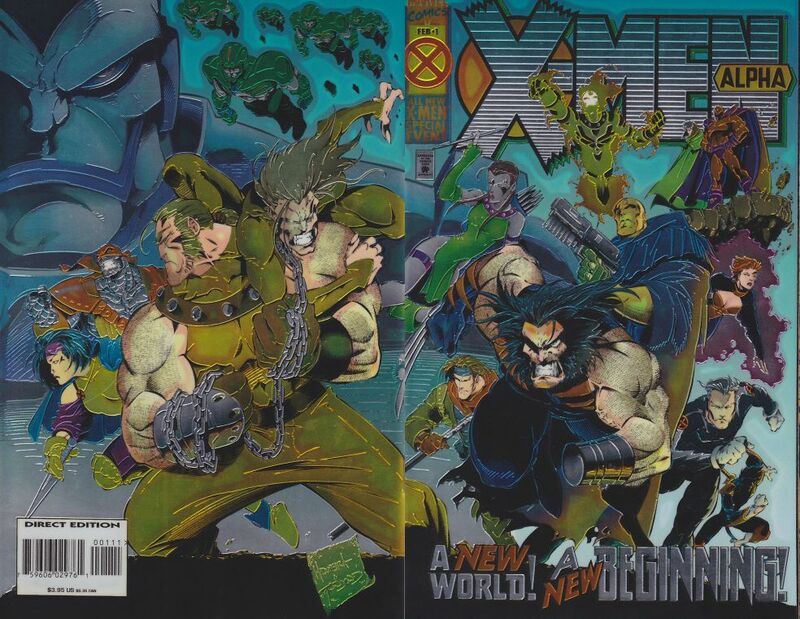 While the two X-men Chronicles issues cover events that take place in the past, X-men: Alpha was the real introduction to the Age of Apocalypse, being released before all the other issues. This was the first thing that the current readers saw at the time to introduce them to this world. We follow a hooded man of African American descent as he tracks a group of marauders known as the Infinites. He manages to save a young girl from their attack, but is beaten himself, until the X-men arrive. This team is similar to the one we saw at the end of X-men Chronicles #2, except Blink, Nightcrawler, Morph and Wild Child are also present. The X-men make quick brutal work in taking out the Infinites, until only their leader Unus remains. He’s dispatched by Iceman, who cracks the man apart while making a wisecrack at the same time. This all works as a very solid introduction to the world. We see the X-men functioning as a strong powerful unit led by Magneto. Morph is here because he proved so popular in X-men the Animated Series, though he looks very different. In the main timeline he’s long since dead, but they’re given the chance to bring him back in this alternate reality. Unus was a follower of Magneto in the main timeline, but now that Magneto is good they are enemies. And finally, the Iceman of the main timeline would never do anything this ruthless, but desperate times call for desperate measures, and we see how desperate things are here because no one cares about the way he thoughtlessly kills Unus. 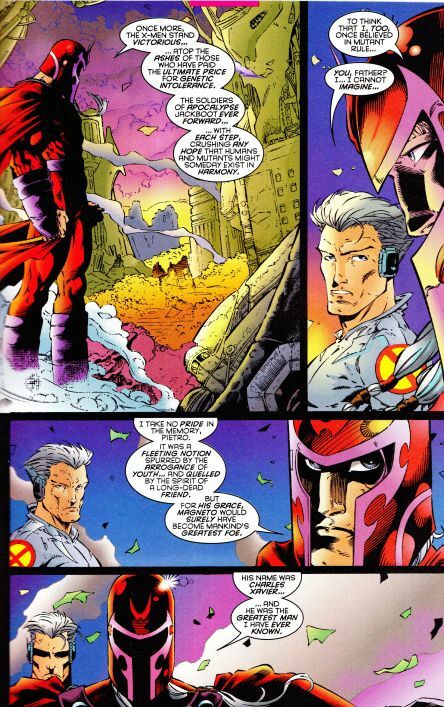 Just in case we didn’t read the previews, Magneto tells us how he’s changed from the young man he once was. The hooded man is revealed to be Bishop, an already time displaced mutant in our timeline who became even more displaced after the attempt to stop Legion from committing his assassination in the past. Because of this temporal displacement, he is the only one who remembers things as they once were. After he accuses Magneto for causing this whole mess, Magneto makes him pass out by slowing the flow of blood to his brain by manipulating the iron in it. We’ll just pretend that’s plausible for now and move on. We cut to a slightly darker colored Beast than we’re used to experimenting on “Mr. Dukes” better known to us X-men fans as the Blob. He doesn’t take too kindly to Beast trying to “find his genetic potential” and Havok has to save Beast when Blob attacks him. He doesn’t entirely succeed, and older brother Cyclops appears shortly thereafter. Despite being on the side of the bad guys, he’s still playing the good soldier here, telling Beast to halt his experiments because Apocalypse is trying to negotiate a treaty with the humans that will not allow for genetic experimentation. He also apparently does not get along well with his brother, but has bonded quite closely to Mr. Sinister and gets very upset when he finds out he’s leaving. And no, Scott’s not just being emo before it was cool – he is an actual cyclops now, and his hair is like that in every panel to cover up his missing eye. We cut again to a club owned by the Angel, who was clearly never transformed to Archangel here, where both mutants and humans can gather in peace. It’s called Heaven. Gambit appears at the club asking Angel to help him get in touch with Magneto, because he knows Angel has the connections. Angel doesn’t really want to tell Gambit, but he does so because of something that happened between them in Louisiana. As far as I know, we never find out what that something is, but it’s a nice way to develop the history of this world regardless. Apparently Magneto and his X-men are hiding out in Westchester, because Xavier’s mansion has remained intact and it’s not like he’s using it anyway. We also quickly find out that Magneto and Rogue have a child together, named Charles, and that Rogue is unable to make physical contact with him. Bishop refuses to do anything other than throw accusations at Magneto, so Magneto asks Rogue to do what she must and touch Bishop in order to see inside his mind. Before we see the result of those actions, we cut to three of Apocalypse’s current Four Horsemen having a meeting with him. Besides Sinister, there is also Abyss and Holocaust. The fourth and no show is named Mikhail. Apocalypse is planning to betray the humans and start a civil war where only the strong will survive. Sinister is not so eager about the great loss of mutant life that will no doubt result from it. He has apparently given information to Weapon X and Jean to give to the human council to give them a heads up of the planned double cross. So now we know what the two of them have been up to since leaving the X-men in the last issue. Back in Westchester, Rogue goes to touch Bishop while Magneto assures us he’s not being absolutely cruel to her because his bio-magnetic shield will prevent the transfer from being too severe. However, none of them are prepared for the way Bishop’s power works. Somehow, it causes Magneto to see Bishop’s memories along with Rogue, and he sees glimpses of himself in the normal timeline. As you can imagine, it shakes him up very badly. 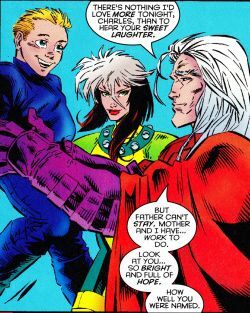 Gambit bursts into the room and breaks the connection between Bishop, Rogue and Magneto. While Sabretooth is ready to break Gambit’s neck, Magneto stops him, as he’s called Gambit here for a specific purpose. But we don’t know what that purpose is yet. Instead, Magneto asks Nightcrawler to find his mother Mystique. Having seen this glimpse of the main timeline, Magneto senses that Bishop is correct and that things are not as they should be. The final page of the issue assures us that there is something large posing a threat to this world, and that thing is crystalline in nature. Those of us who were current X-men readers at the time already know that this is the M’Kraan crystal. 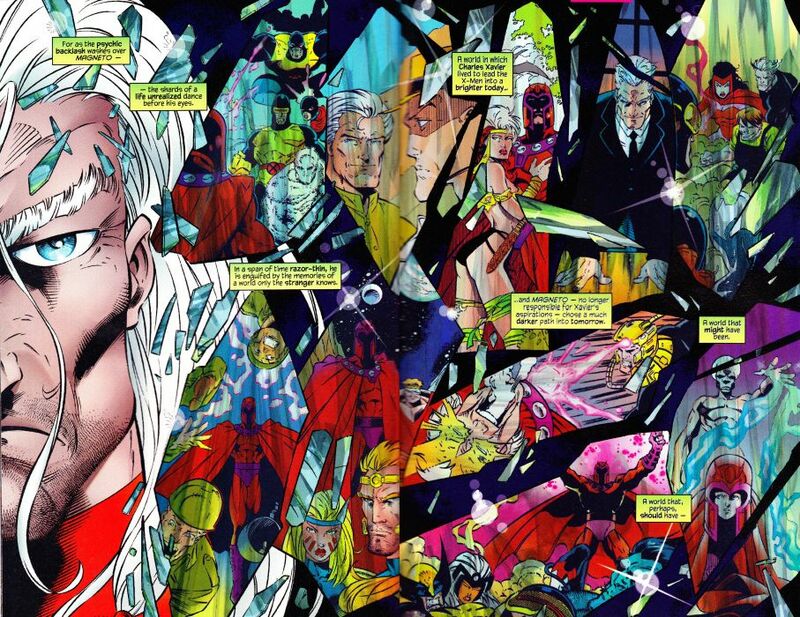 When Legion caused Xavier’s death in the past, the crystal had wiped over everything that had been happening in the main timeline, and for whatever reason, the same seems to be happening here as well. Overall, I’d call this a fairly solid introduction, and a good issue. There’s a lot of storylines going on here, but it juggles them fairly well and keeps the pacing even. Lots of things are teased for the upcoming storyline, and it’s not so little to make you completely clueless but also leaves you thirsting for more. There’s also a lot of great cameos here for the die hard fans. Karma makes a brief appearance in Angel’s club, Nanny is now a good robot helping to take care of Charles while the X-men are out, Emma Frost is with the humans with a strange shaved section in her hair to suggest her powers have been dampened or eliminated, and apparently in this reality Moira McTaggart has married Bolivar Trask. Next time we’ll check in with the younger mutants with Generation Next #1. 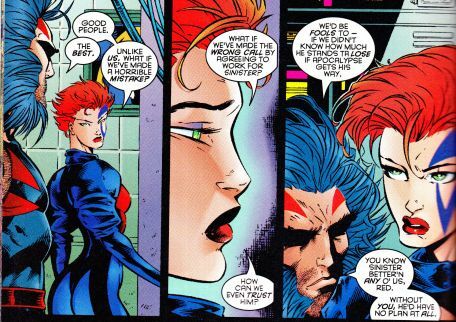 This entry was posted in One Man's Worth and tagged Age of Apocalypse, X-men by Angie. Bookmark the permalink.